The human body literally glows, emitting a visible light in extremely small quantities at levels that rise and fall with the day. Past research has shown that the body emits visible light, 1,000 times less intense than the levels which can be seen with the naked eye. In fact, virtually all living creatures emit very weak light. Gone are the days when words like “life energy” and “aura” were relegated to a few books in a tiny section of some New Age store. Today, scientists across the world are investigating the energies that propel, and likely even rule, life itself and hence have a profound impact on your health. Eastern medical traditions have operated on this premise for thousands of years, but Western medicine in its myopic focus on dissected parts has been slow to adopt these ancient truths. There is an emerging trend of clinicians who recognize that a far more powerful approach to healing is one that is based on physics and not on chemistry. Many natural health experts believe that your body is not only made up of tissue, blood vessels and organs. It’s also composed of energy, or chi as it’s called in traditional Chinese medicine (TCM). This energy is circulated through your body along specific meridians, and when points on your skin that correspond to certain meridians are manipulated, the energy circulation and your internal organs are affected. Acupuncture is one well-known modality used to manipulate the flow of your meridians, but there are others. The term “energy medicine” and modalities such as meridian tapping techniques have become more and more widespread, even though conventional medicine still largely ignores it. Schematic illustration of experimental setup that found the human body, especially the face, emits visible light in small quantities that vary during the day. B is one of the test subjects. The other images show the weak emissions of visible light during totally dark conditions. The chart corresponds to the images and shows how the emissions varied during the day. The last image (I) is an infrared image of the subject showing heat emissions. But your body is also surrounded by light, or energy. What’s really interesting about this study is that they discovered these light emissions appear to be linked to your body clock and the rhythmic fluctuations of your metabolism over the course of the day. This suggests that you could detect medical conditions with the use of highly light-sensitive cameras. “If you can see the glimmer from the body’s surface, you could see the whole body condition”, said researcher Hitoshi Okamura, a circadian biologist at Kyoto University in Japan. There are other devices that can accomplish a similar feat already, such as electrodermal screening, which measures your electrical skin resistance to gain information about your chi flow. If an electrodermal screening finds that certain meridian points are out of balance there are numerous non-invasive ways, such as massage therapy, herbal medicine and homeopathy, to bring them back into homeostasis. Dr. Dietrich Klinghardt discusses this field in The Five Levels of Healing, which is based on a healing model developed some 12,000 years ago. This energetic model for health has influenced Tibetan medicine, traditional Chinese medicine (TCM), and Ayurvedic medicine as well. The existence of the biophoton field was scientifically proven by Dr. Fritz-Albert Popp in 1974. Your physical health is dependent not only on what goes on inside of your body, but is also interconnected with and dependent on other non-physical levels of energy, such as the energy surrounding your body, called the biophoton field. In highly simplistic terms, your biophoton field can be viewed as a highly sophisticated computer that processes, stores and retrieves information that is then used to regulate your biological processes. Dr. Popp also proved that biophotons originate from your DNA and that they are laser-like in nature. He developed the biophoton theory to explain their biological role and the ways in which they help control your biochemical processes. The DNA inside each cell in your body vibrates at a frequency of several billion hertz (which is unfortunately the same range at which modern cell phone communication systems also work). This vibration is created through the coil-like contraction and extension of your DNA — which occurs several billion times per second — and every time it contracts, it squeezes out one single biophoton; a light particle. All the photons that are emitted from your body communicate with each other in this highly structured light field that surrounds your body. This light field also regulates the activity of your metabolic enzymes. This corresponds nicely with the findings in the study above that show your light field ebbs and flows along with your metabolic rhythm. Have You Ingested Healthy Light Today? A fascinating alternative practice that Dr. Klinghardt has started using, based on this premise, is to use tools that work with light to influence your biophoton field in beneficial ways. 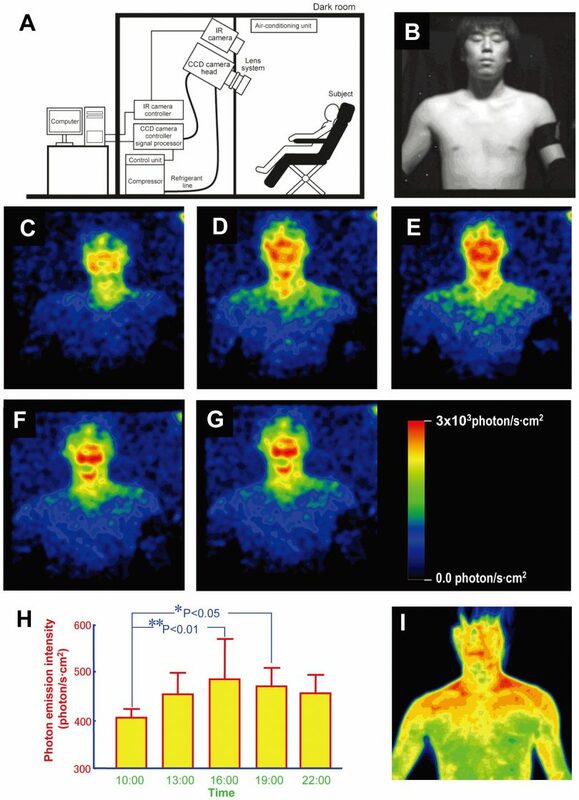 For example, transmitting the information of nutrients in the form of light into your biophoton field can affect your body in the same way as eating the actual nutrient! Biophoton research also puts a whole new spin on the impact of environmental toxins. Mercury, for example, destroys your tubulins at extremely low concentrations. Remember, tubulins are the light-conductive molecules in your connective tissues, so by disrupting these all-important light transmissions from your biophoton field to your cells to your metabolic enzymes, mercury effectively disconnects the intelligent force that organizes your biochemistry. All the more reason to avoid those thimerosal-laden flu shots. Biophoton research also explains the underlying principles of why it’s so vital to eat a diet of mostly RAW food. As you know, without the sun it is virtually impossible for most life forms to exist. For example, we now know that without appropriate sun exposure you will become deficient in vitamin D, which will have very far ranging consequences for your health. Vitamin D influences at least 2,000-3,000 genes (that we know of), and without sufficient amounts of vitamin D, your body becomes susceptible to a staggering amount of diseases. But you can absorb sun energy via your food as well as through your skin (although this should not be confused with being able to alter your vitamin D status). Dr. Johanna Budwig from Germany has stated that live foods are electron-rich, and act as high-powered electron donors and “solar resonance fields” in your body to attract, store and conduct the sun’s energy in your body. The greater your store of light energy, the greater the power of your overall electromagnetic field, and consequently the more energy is available for healing and maintenance of optimal health. The capacity to store biophotons is therefore a measure of the quality of your food. I firmly believe it’s only a matter of time before these truths will become common scientific and medical knowledge. You can help speed things up by sharing what you know with your family and friends.